In 1979 America (Dewey Bunnell and Gerry Beckley) were at the height of their popularity and had just released "Silent Letter" their first album as a duo following the departure of fellow founding member Dan Peek. 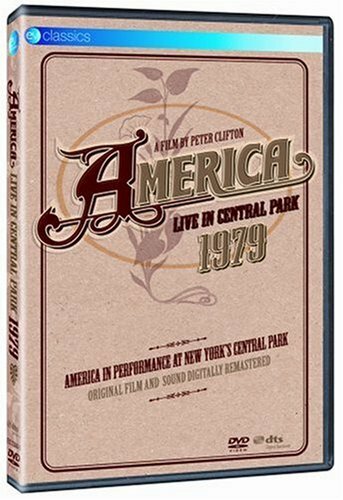 Acclaimed Australian filmmaker Peter Clifton captured the band at their concert in New York's Central Park and then followed them across to California where he filmed them in the studio and on location. All of this footage was combined to make America "Live In Central Park". TRACK LISTING: 1. Intro 2. Tin Man 3. Only Game in Town 4. I Need You 5. Foolin' 6. Ventura Highway 7. California Dreamin' 8. Another Try 9. A Horse With No Name 10. All Night 11. Here 12. Hollywood 13. Sandman 14. Sister Golden Hair BONUS FEATURES: Full length commentary by director Peter Clifton.